In a deployment where there are multiple Spotlight Diagnostic Server you may choose to federate the deployment. Does the deployment need more than one Spotlight Diagnostic Server? The number of connections to monitor exceeds the design of one Spotlight Diagnostic Server. A single Spotlight Diagnostic Server is designed to monitor a maximum of 100 SQL Servers, Analysis Services or Replication instances and 100 Windows servers. Your organization is suited to the deployment of geographic hubs, where each geographic region deploys its own Spotlight Diagnostic Server. Multiple Spotlight Diagnostic Server may be deployed separately. 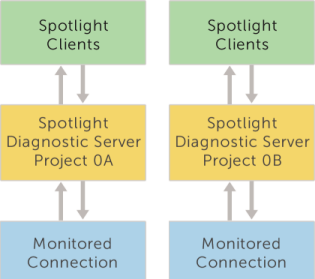 A Spotlight Client monitors connections from one Spotlight Diagnostic Server at a time. The deployments do not share custom views, templates and alarm actions. 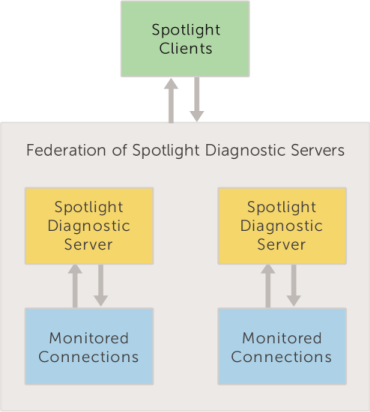 When the deployment is federated a Spotlight Client monitors connections from all Spotlight Diagnostic Server in the federation. Spotlight Clients in the federation share the same custom views, templates, alarm actions and list of planned outages. Note: Since Spotlight Enterprise 12.1 the Spotlight Client performance has been optimized for large-scale environments (up to 1500 connections). This is especially true in environments that are federated. Areas of major optimization are: opening the Spotlight Client (improved 1.5 times), adding connections (improved 1.8 times), deleting connections (improved 5.5 times), configure Alarms/Schedule (improved 1.8 times), modifying a view (improved 20 times), deleting a view ( improved 12 times), navigating connections (improved 1.5 times).